Below is what happened in search today, as reported on Search Engine Land and from other places across the web. The post SearchCap: AdWords reports, CTR data & Google Maps ads appeared first on Search Engine Land. The agency looked at expanded text ad performance from both brand and non-brand traffic. The post Merkle’s early data on expanded text ad CTRs: results are mixed appeared first on Search Engine Land. Excited about Googles new map ads? You should be! Google Maps ads are changing to help local businesses become more visible. Columnist Will Scott discusses the four features you should be most excited about. The post Excited about Google’s new map ads? You should be! appeared first on Search Engine Land. New to the world of search engine optimization (SEO)? Columnist John Lincoln explains some things you might not know about this online marketing discipline. The post 9 things most people don’t understand about SEO appeared first on Search Engine Land. Howdy, Moz fans, and welcome to another edition of Whiteboard Friday. 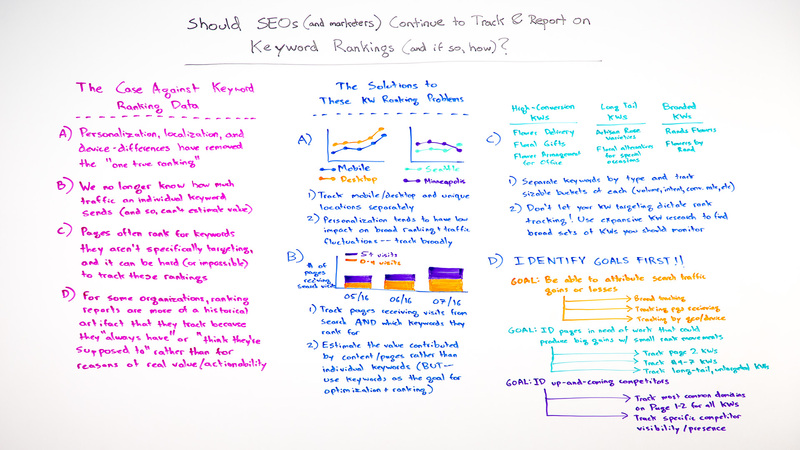 This week we're going to chat about keyword ranking reports. There have been a few articles that have come out recently on a number of big industry sites around whether SEOs should still be tracking their keyword rankings. I want to be clear: Moz has a little bit of a vested interest here. And so the question is: Can you actually trust me, who obviously I'm a big shareholder in Moz and I'm the founder, and so I care a lot about how Moz does as a software business. We help people track rankings. Does that mean I'm biased? I'm going to do my best not to be. So rather than saying you absolutely should track rankings, I'm instead going to address what most of these articles have brought up as the problems of rank tracking and then talk about some solutions by which you can do this. My suspicion is you should probably be rank tracking. I think that if you turn it off and you don't do it, it's very hard to get a lot of the value that we need as SEOs, a lot of the intelligence. It's true there are challenges with keyword ranking reports, but not true enough to avoid doing it entirely. We still get too much value from them. So let's start with the case against keyword ranking data. First off, "keyword ranking reports are inaccurate." There's personalization, localization, and device type, and that biases and has removed what is the "one true ranking." We've done a bunch of analyses of these, and this is absolutely the case. Personalization, turns out, doesn't change ranking that much on average. For an individual it can change rankings dramatically. If they visited your website before, they could be historically biased to you. Or if they visited your competitor's, they could be biased. Their previous search history might have biased them in a single session, those kinds of things. But with the removal of Google+ from search results, personalization is actually not as dramatically changing as it used to be. Localization, though, still huge, absolutely, and device differences, still huge. But we can address this, and the way to do that is by tracking these things separately. So here you can see I've got a ranking report that shows me my mobile rankings versus my desktop rankings. I think this is absolutely essential. Especially if you're getting a lot of traffic from both mobile and desktop search, you need to be tracking those separately. Super smart. Of course we should do that. We can do the same thing on the local side as well. So I can say, "Here, look. This is how I rank in Seattle. Here's how I rank in Minneapolis. Here's how I rank in the U.S. with no geographic personalization," if Google were to do that. Those types of rankings can also be pretty good. It is true that local ranked tracking has gotten a little more challenging, but we've seen that folks like, well Moz itself, but folks like STAT (GetStat), SERPs.com, Search Metrics, they have all adjusted their rank tracking methodologies in order to have accurate local rank tracking. It's pretty good. Same with device type, pretty darn good. Another big problem that is expressed by a number of folks here is we no longer know how much traffic an individual keyword sends. Because we don't know how much an individual keyword sends, we can't really say, "What's the value of ranking for that keyword?" Therefore, why bother to even track keyword rankings? I think this is a little bit of spurious logic. The leap there doesn't quite make sense to me. But I will say this. If you don't know which keywords are sending you traffic specifically, you still know which pages are receiving search traffic. That is reported. You can get it in your Google Analytics, your Omniture report, whatever you're using, and then you can tie that back to keyword ranking reports showing which pages are receiving traffic from which keywords. Most all of the ranked tracking platforms, Moz included, has a report that shows you something like this. It says, "Here are the keywords that we believe are likely to have sent these percentages of traffic to this page based on the keywords that you're tracking, based on the pages that are ranking for them, and how much search traffic those pages receive." So let's track that. We can look at pages receiving visits from search, and we can look at which keywords they rank for. Then we can tie those together, which gives us the ability to then make not only a report like this, but a report that estimates the value contributed by content and by pages rather than by individual keywords. In a lot of ways, this is almost superior to our previous methodology of tracking by keyword. Keyword can still be estimated through AdWords, through paid search, but this can be estimated on a content basis, which means you get credit for how much value the page has created, based on all the search traffic that's flowed to it, and where that's at in your attribution lifecycle of people visiting those pages. Pages often rank for keywords that they aren't specifically targeting, because Google has gotten way better with user intent. So it can be hard or even impossible to track those rankings, because we don't know what to look for. Well, okay, I hear you. That is a challenge. This means basically what we have to do is broaden the set of keywords that we look at and deal with the fact that we're going to have to do sampling. We can't track every possible keyword, unless you have a crazy budget, in which case go talk to Rob Bucci up at STAT, and he will set you up with a huge campaign to track all your millions of keywords. If you have a smaller budget, what you have to do is sample, and you sample by sets of keywords. Like these are my high conversion keywords — I'm going to assume I have a flower delivery business — so flower delivery and floral gifts and flower arrangements for offices. My long tail keywords, like artisan rose varieties and floral alternatives for special occasions, and my branded keywords, like Rand's Flowers or Flowers by Rand. I can create a bunch of different buckets like this, sample the keywords that are in them, and then I can track each of these separately. Now I can see, ah, these are sets of keywords where I've generally been moving up and receiving more traffic. These are sets of keywords where I've generally been moving down. These are sets of keywords that perform better or worse on mobile or desktop, or better or worse in these geographic areas. Right now I can really start to get true intelligence from there. Don't let your keyword targeting — your keyword targeting meaning what keywords you're targeting on which pages — determine what you rank track. Don't let it do that exclusively. Sure, go ahead and take that list and put that in there, but then also do some more expansive keyword research to find those broad sets of search terms and phrases that you should be monitoring. Now we can really solve this issue. This one I think is a pretty insidious problem. But for many organizations ranking reports are more of a historical artifact. We're not tracking them for a particular reason. We're tracking them because that's what we've always tracked and/or because we think we're supposed to track them. Those are terrible reasons to track things. You should be looking for reasons of real value and actionability. Let's give some examples here. What I want you to do is identify the goals of rank tracking first, like: What do I want to solve? What would I do differently based on whether this data came back to me in one way or another? If you don't have a great answer to that question, definitely don't bother tracking that thing. That should be the rule of all analytics. So if your goal is to say, "Hey, I want to be able to attribute a search traffic gain or a search traffic loss to what I've done on my site or what Google has changed out there," that is crucially important. I think that's core to SEO. If you don't have that, I'm not sure how we can possibly do our jobs. We attribute search traffic gains and losses by tracking broadly, a broad enough set of keywords, hopefully in enough buckets, to be able to get a good sample set; by tracking the pages that receive that traffic so we can see if a page goes way down in its search visits. We can look at, "Oh, what was that page ranking for? Oh, it was ranking for these keywords. Oh, they dropped." Or, "No, they didn't drop. But you know what? We looked in Google Trends, and the traffic demand for those keywords dropped," and so we know that this is a seasonality thing, or a fluctuation in demand, or those types of things. And we can track by geography and device, so that we can say, "Hey, we lost a bunch of traffic. Oh, we're no longer mobile-friendly." That is a problem. Or, "Hey, we're tracking and, hey, we're no longer ranking in this geography. Oh, that's because these two competitors came in and they took over that market from us." We could look at would be something like identify pages that are in need of work, but they only require a small amount of work to have a big change in traffic. So we could do things like track pages that rank on page two for given keywords. If we have a bunch of those, we can say, "Hey, maybe just a few on-page tweaks, a few links to these pages, and we could move up substantially." We had a Whiteboard Friday where we talked about how you could do that with internal linking previously and have seen some remarkable results there. We can track keywords that rank in position four to seven on average. Those are your big wins, because if you can move up from position four, five, six, seven to one, two, three, you can double or triple your search traffic that you're receiving from keywords like that. You should also track long tail, untargeted keywords. If you've got a long tail bucket, like we've got up here, I can then say, "Aha, I don't have a page that's even targeting any of these keywords. I should make one. I could probably rank very easily because I have an authoritative website and some good content," and that's really all you might need. We might look at some up-and-coming competitors. I want to track who's in my space, who might be creeping up there. So I should track the most common domains that rank on page one or two across my keyword sets. I can track specific competitors. I might say, "Hey, Joel's Flower Delivery Service looks like it's doing really well. I'm going to set them up as a competitor, and I'm going to track their rankings specifically, or I'm going to see..." You could use something like SEMrush and see specifically: What are all the keywords they rank for that you don't rank for? This type of data, in my view, is still tremendously important to SEO, no matter what platform you're using. But if you're having these problems or if these problems are being expressed to you, now you have some solutions. I look forward to your comments. 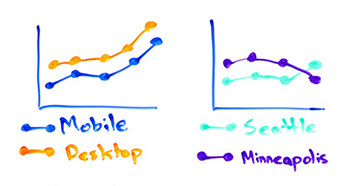 We'll see you again next week for another edition of Whiteboard Friday. Take care. Based on AdWords cross-device conversion data, the new reports show device influence through the full conversion path. The post AdWords gains 3 new cross-device attribution reports appeared first on Search Engine Land. Below is what happened in search today, as reported on Search Engine Land and from other places across the web. The post SearchCap: Google iOS app, Google Search Console export & AdWords characters appeared first on Search Engine Land. Last month, the second cohort of Launchpad Accelerator, Google’s high-touch global program for late-stage startups, came and conquered their app challenges with the help of mentors at Google HQ. What did they learn that they’d like to share with developers across the world? Check out the video below for solutions from 3 different startups, and an in-depth review of MagicPin’s mobile web challenge and solution. MagicPinfrom India is a social network app that curates a local user base around locations, allowing merchants to connect with these specific audiences. Launchpad Accelerator is a six-month accelerator that enables late-stage app startups from emerging markets to successfully scale. Here's a two-minute video about the Accelerator.